You are here: Home / Ethnic Groups / The People of Java / Who are the Jawa Pesisir Lor? Who are the Jawa Pesisir Lor? 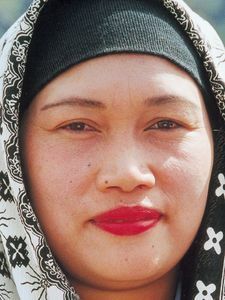 The “Jawa Pesisir Lor” people are a distinctive Muslim Javanese sub-ethnic group. They inhabit the villages, small towns, and cities which stretch south from the North Java Sea to the hills and mountains that span two-thirds of the length of the island of Java. This sub-ethnic group has more in common with the Islamic Malay-speaking traders and seafarers of other Indonesian coastal areas than with their Hindu-mystic Javanese cousins to the south. They are less emotionally reserved, and in personal communication they can be direct and aggressive. Although the majority of the Jawa Pesisir Lor people are farmers, fishermen, or both, the trend is for them to seek training for an increasing variety of urban and rural occupations throughout Indonesia. Every day the Pesisir Lor diet consists of a variety of rice and soybean-cake dishes, including vegetables and an occasional egg or bit of meat, always cooked with spices and served with either tea or coffee. Arabic clothing style and drama forms are the current rage. Pesisir “batik” cloth is an explosion of bright colors. The Pesisir Lor people’s preferred musical instruments are cymbals, drums, and two stringed musical instruments, rather than the traditional five-tone Javanese “gamelan.” Reading the Qur’an and practicing martial arts take precedence over shadow plays and courtly dances. One-story bamboo-framed homes and modern brick homes are built side by side, both constructed with red tiled roofs. Nearly all of the Pesisir Lor people profess the Sunni Islamic faith, but Sufi mystical beliefs are widely practiced. Orthodox “santri” Muslims seek divine favor through the mediating spirit of Sheik Abdul Kadir Jaelani and the public reading of his holy book, Manaqib. In contrast, mystic “abangan” Javanese perform the “Selametan Rasulan” religious ritual to seek the blessings of not only the prophet Mohammed, but also numerous saints, spirits and deities. Most orthodox Javanese seek to practice the nine guidelines laid down by Sunan Ja’far and Sunan Kalijaga, two of the nine original Islamic missionaries who brought Islam to the north coast of Java and whose graves there are venerated to this day. These nine guidelines include: religious law, reality, mysticism, wisdom, confession of faith, ritual prayers, alms, fasting, and pilgrimage. Groups of the Javaneses Pesisir Lor people travel to these graves year-round asking the ancient spirits for health, salvation and sustenance. The Pesisir Lor need better access to underground water sources and a better system of dams and irrigation. More large-scale industry needs to be developed throughout the area in order to provide a greater variety of work opportunities for the poor masses. Current channels for many of their industrial and commercial products are not adequate.